Over the next three Wednesdays I’m going to cast an analytical eye over the races within the race at the Tour de France, to explore where key battles will be won by the mass of riders whose objective is something other than the yellow jersey. I’m starting with an examination of the battle for the polka dot jersey, awarded to the winner of the King of the Mountains classification. When is the action likely to occur and why? Points are awarded for each categorised climb. 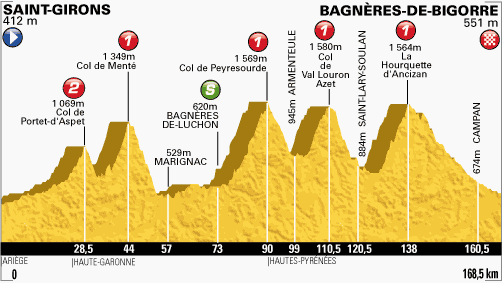 These are ranked by difficulty from fourth category up to HC (hors catégorie), of which there are seven on the 2013 parcours. For a fourth category climb, only the leading rider receives a single point, whereas for an HC climb the top ten earn points, up to 25. Furthermore, if a stage finishes at the summit of a second category or higher climb, points are doubled (i.e. on an HC summit finish the winner receives 50 points, then 40 for second and so on). This year has four such finishes (stages eight, 15, 18 and 20). The rider with the most points at the end of each stage wears the polka dot jersey the following day as the leader of the mountains classification, with the top scorer in Paris winning the competition overall. The battle for the polka dot jersey is focussed on a few key stages. This year, there are six stages which account for more than 80% of the points on offer, all seven HC climbs and all four summit finishes. There are at least 45 points up for grabs on each of these days. With double points available for the four big summit finishes, which are most likely to be disputed by the men battling it out for the general classification, there is a significant chance the polka dot jersey will be won by one of them. However, it is still possible for a good climber who is not a GC threat to tot up the most points by targeting their efforts in the right places. 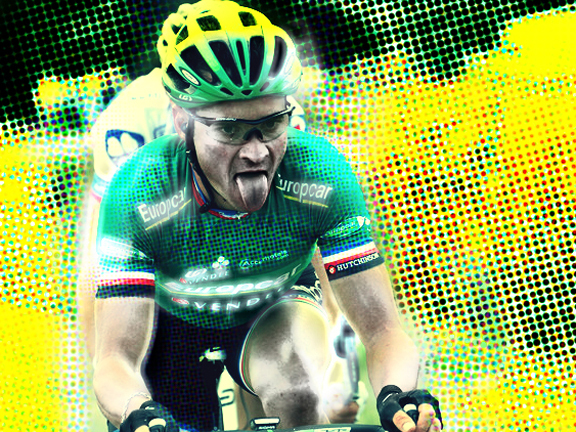 Thomas Voeckler achieved exactly that last year by winning two stages which featured high points-paying climbs but did not end in summit finishes. Strategy, opportunism and no small amount of luck will all be important in deciding who finishes in the polka dot jersey. The competition is rarely won by the best pure climber or even the rider who wins the most mountain stages, but by the man who maximises his return on selected stages. Broadly speaking, if a GC contender wins the King of the Mountains it will be down to consistent high positions on the big summit finishes which yield double points. For anyone else, victory will be built on long breakaways on days which feature multiple high-tariff climbs. Here’s a quick look at the six highest-scoring days, and how these will shape the fate of the polka dot jersey. Climbs: Cat 4, HC, cat 1 summit finish. What’s likely to happen? 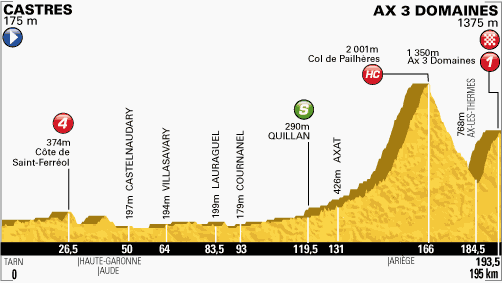 : This is the first high summit finish, so the GC contenders are likely to force a competitive finish up to the summit of the cat 1 Ax 3 Domaines. As a result, the day’s breakaway is unlikely to survive, but expect it to feature many of those with an interest in the polka dot jersey, for whom the 25 points on offer at the summit of the Col de Pailheres will offer a big incentive. Climbs: Cat 2, followed by four cat 1s, with a downhill finish. What’s likely to happen? : One for a breakaway of KoM specialists and stage-hunters. This is the last stage of a nine-day opening week, so expect the peloton to ride piano and happily allow a large break to slip away to contest the win. 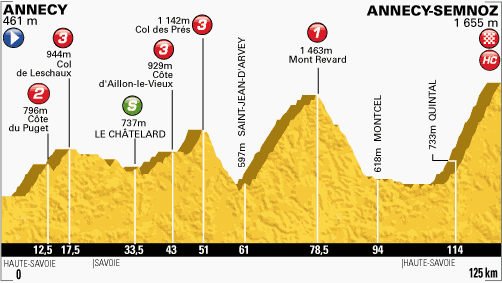 Polka dot aspirants will target the 45 points on offer over the five summits, while stage-hunters will conserve their energies and dream of raising their arms in victory at the finish at Bagneres de Bigorre. Climbs: Three cat 4s, a cat 3 and a summit finish on the HC Mont Ventoux. What’s likely to happen? : A day which favours the GC men over the KoM contenders. With the second rest day following immediately after, the yellow jersey group will probably reel in any breakaway. However, the length of the stage – at 242.5km, the longest of this year’s Tour – means someone might just stay away for victory and 50 points while the top men mark each other to distraction. I wouldn’t count on it, though. 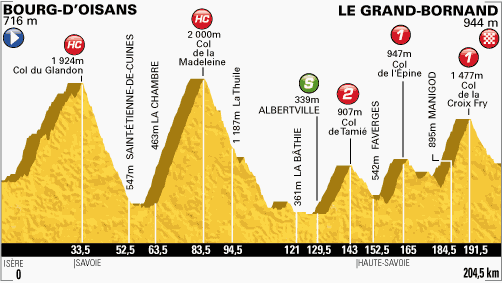 Climbs: Three cat 2s, a cat 3 and two ascents of the HC Alpe d’Huez, the last being a summit finish. What’s likely to happen? : This stage offers more points than any other. The battle for stage victory will almost certainly come down to the GC contenders, but with 42 points on offer over the first five climbs there is plenty of reason for the KoM men to go on the attack. Climbs: Two HCs and a cat 2, followed by two cat 1s and a downhill finish. What’s likely to happen? : Sandwiched between two summit finishes this is likely to be a day when the GC contenders take a breather and allow a break to contest both the points and the win. Indeed, with 50 of the 75 points available coming on the Glandon and the Madeleine in the first half of the stage, we may see some breakaway members sitting up after the second summit to save their energy for the following day. Climbs: Cat 2, followed by three cat 3s and a cat 1 before the HC summit finish at Annecy-Semnoz. What’s likely to happen? : The final GC showdown is likely to spell doom for the breakaway, the composition of which will depend on how close the polka dot jersey battle is. There are just 21 points available before the final climb, so anyone looking to overhaul the classification leader may well need to mix it with the GC men and hope to score a high finish. It’s basically all or nothing here, as there are just two points available on the final stage. It’s difficult to predict exactly which way the final result will fall. If a GC contender dominates the four summit finishes, we could well see the same rider winning both the yellow and polka dot jerseys. Alternatively if breakaways are allowed to win one or more of the summit finishes, this could tip the favour back towards the KoM specialists. 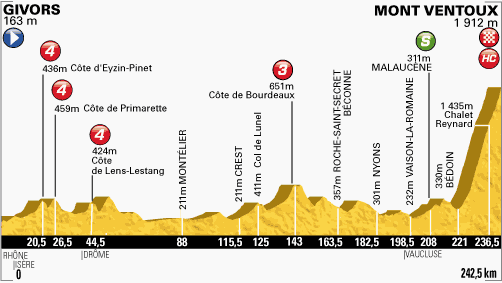 We’re also likely to see different riders targeting their big efforts on different combinations of stages – this year’s route is too hard to go maximum attack on all six key stages – so we will see the ranking ebb and flow from day to day. One thing seems for sure. Riders who are genuinely targeting the polka dot jersey will need to show their hand on stages eight or nine, and probably both. 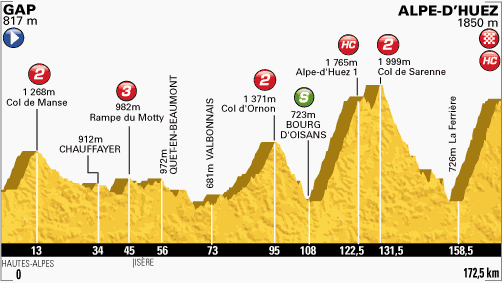 We’ll know who the main contenders are by the first rest day, but it will not be until deep into the triptych of killer Alpine days on stages 18-20 that the final picture will become clear.